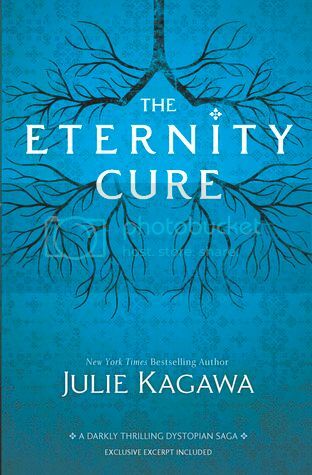 The Eternity Cure is the second book in the Blood of Eden series by Julie Kagawa. Last year, I read and loved The Immortal Rules, so I had extremely high expectations when I started reading The Eternity Cure. Julie Kagawa definitely did not disappoint. This novel was a brilliant addition to an already wonderful series. I’m attempting to keep this review as spoiler free as possible, but there may be a few things mentioned that happened in the previous book. If you haven’t started this series yet; read at your own risk! The Eternity Cure picks up right where The Immortal Rules leaves off. Allie is on a mission to find her sire, Kanin, who is being tortured by the crazy psycho vamp that we met in the previous book. With the help of some very unlikely sources along the way, it’s up to Allie to rescue Kanin, and to also find a cure for the virus that is killing both humans and vampires alike. I must say, I have loved Allie since I first met her in The Immortal Rules. She is such an amazingly strong and determined character. She is definitely one of my all time favorite heroines! I don’t want to go much into the secondary characters, but I will just say that we get to see quite a few of the characters that we met in the previous book. I’m not telling who, though! The storyline for the book was, as always, completely engrossing. When I had time to read, I could barely tear my eyes off the page. The world building and detailed descriptions gave me such a clear image of the world that Julie created. The one thing that really got me about the book was the ending. MAJOR CLIFFHANGER! Seriously, I actually thought the book was going to end and the series would be over, but obviously I was wrong. Now I am DYING to get my hands on the next book to see if any of the theories that my dear fellow blogger Kathy and I have discussed will be put into play. Overall, if you have haven’t’ read this series yet, you should definitely check it out. 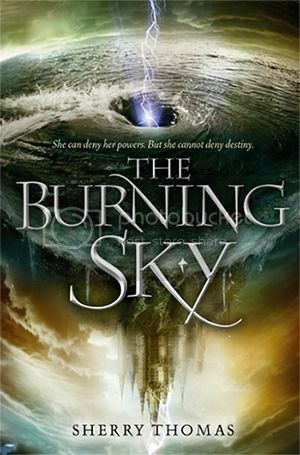 While it’s a lot darker than Julie’s Iron Fey series, it’s still an amazing series to read. Check it out as soon as you can! 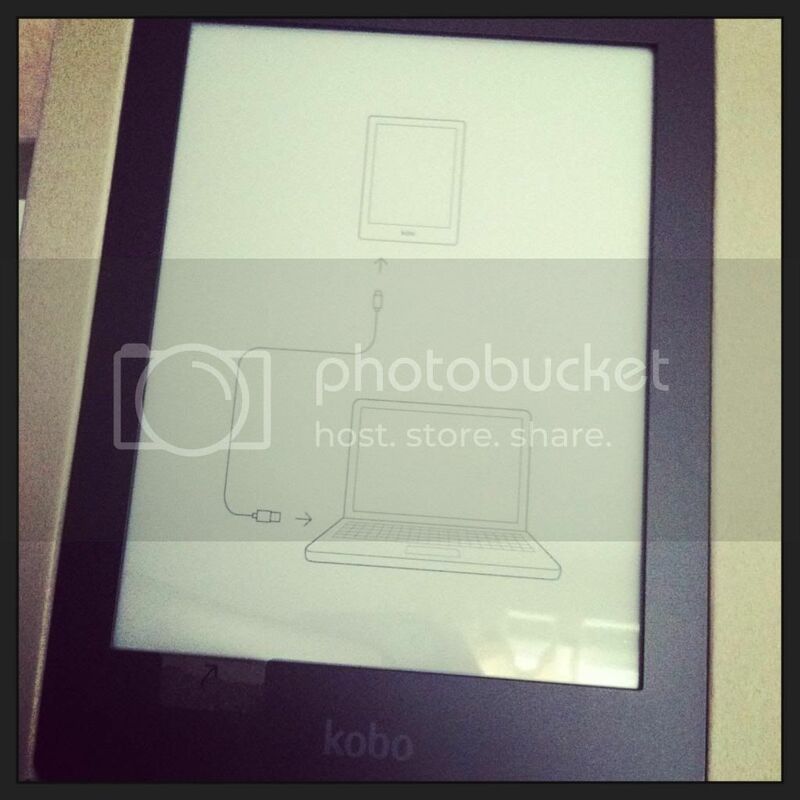 The Kobo Aura HD to review! because I never seem to remember to post what I get throughout the week. I have lots of cool things this week. I can't wait started on my e-galley's. 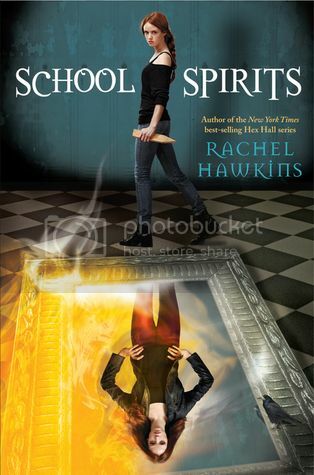 I LOVE Rachel Hawkins, and I'm dying to get started on School Spirit. Sqeeeee! The Kobo is so neat, from the short amount of time that I have had to play with it. 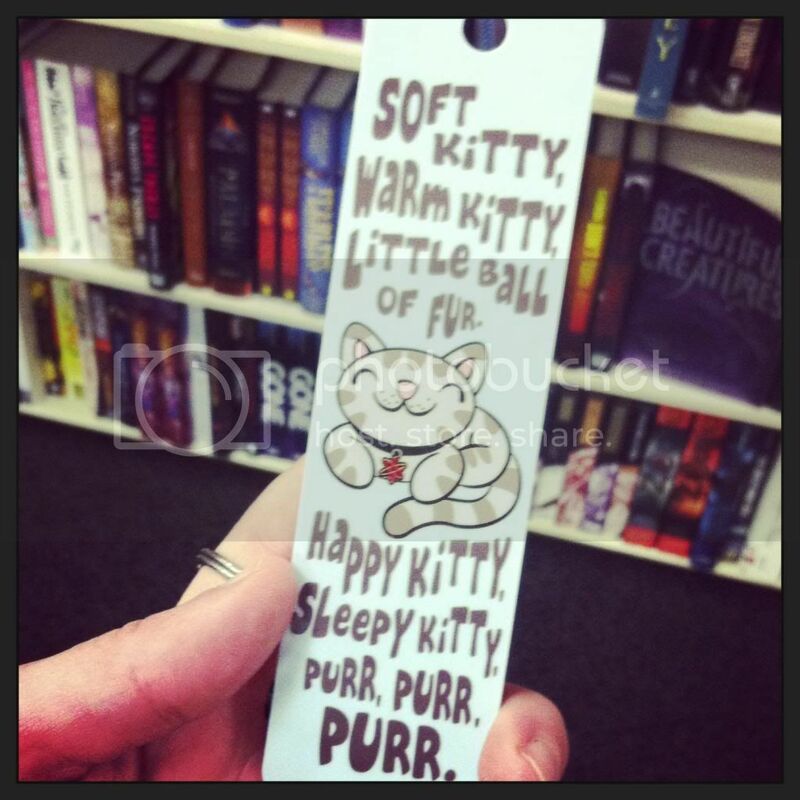 And lastly, I adore the Soft Kitty bookmark. Found at Books-A-Million! 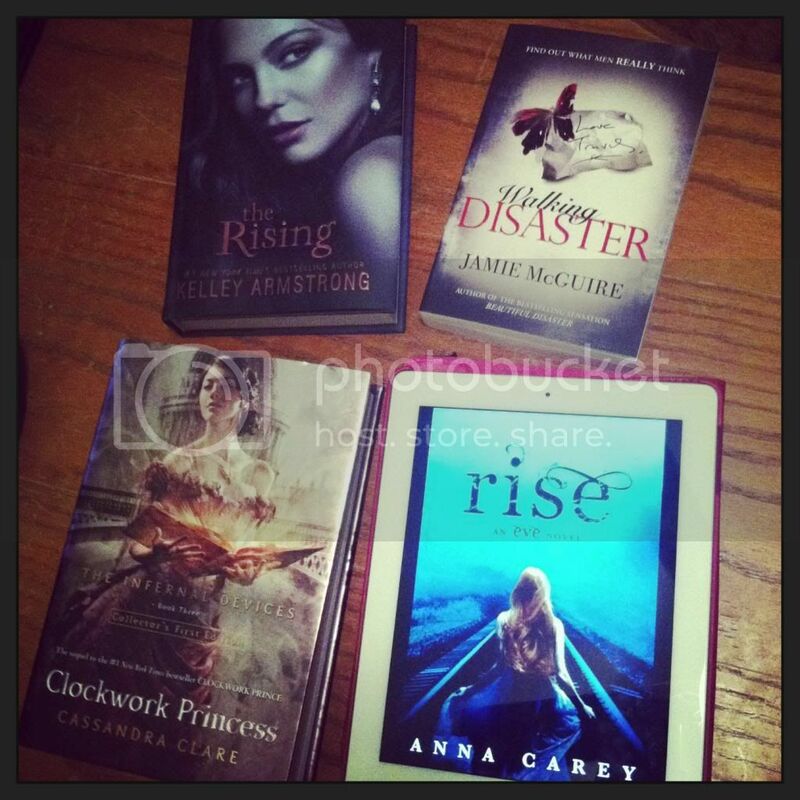 What new books did you get??? Last year I read, and enjoyed, Fracture by Megan Miranda. 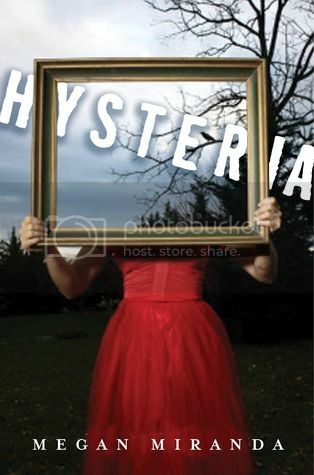 I was so excited to get my hands on a copy of her newest book, Hysteria! It is a wonderfully creepy read that will keep you guessing right up to the end! The main character in the story is Mallory. Poor Mallory has been through a lot in her young life. Her boyfriend is dead—killed by none other than herself in self defense. Her life will never be the same. So she moves to a private school in hopes of starting over. But that isn’t exactly what happens for Mallory. Instead things get worse for her, to the point where the hallucinations start to intrude more and more on her life. But Mallory is a fighter, thank goodness. (I don’t think I could have handled it if she was a weak willed girl!) She believed in herself, even during the confusion and doubt. I admire that about her, and I found her to be a very likeable character. My most favorite character in the book would have to be Reid. I found him to be insanely adorable, and the perfect person to handle Mallory. Even though he has a past of his own, you could tell that he really cared for Mallory, and that would support her no matter what. He was definitely swoon-worthy, in my opinion. There are definitely some characters in the book that you are going to love to hate—Jason and Krista to name a few. But what good is a creepy book if it doesn’t have creepy villains to tie in with it. The storyline for the book was very in-depth, and it kept me guessing as I turned the pages. I had no idea what to expect when I got to the end of the book, but I think it closed up nicely. Overall, If you like creepy reads, you should definitely check out Hysteria. This book even had me looking over my shoulder to see if something was coming! It was definitely an enjoyable read. I can’t wait to check out more of Ms. Miranda’s books in the future! I must admit... I have never read anything by Gretchen McNeil. However, I am SUPER intrigued by her books. They sound so amazingly creepy! And it seems like they just get creepier and creepier. 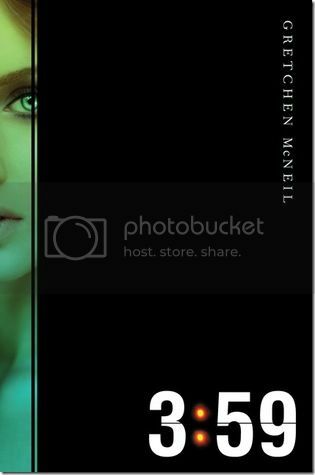 I can't wait to check out 3:59, as well as McNeils other books! 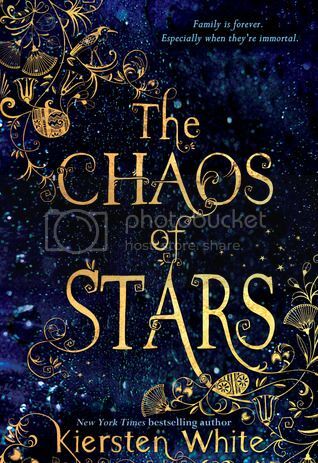 I've never read a book by Sherry Thomas, but I am super excited to check this out. Finally, the highly anticipated follow-up to the New York Times bestseller Beautiful Disaster. Can you love someone too much? I was so thrilled to receive an early e-galley of Walking Disaster. 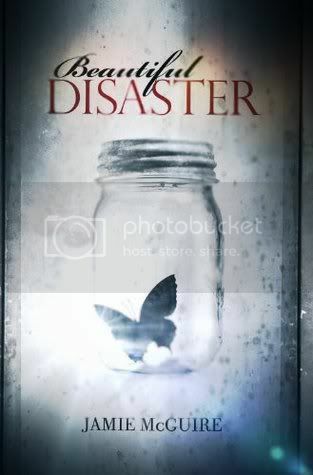 While I had a few issues with the first book, Beautiful Disaster, I still found it to be an engrossing read. 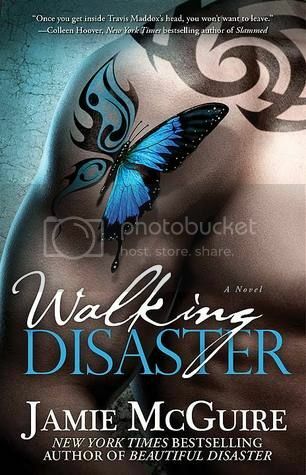 I can honestly say I love Walking Disaster just as much, if not more, than the previous book in the series. Walking Disaster is the story of Beautiful Disaster, only told from Travis’s point of view. Travis Maddox is a mess of a man that I can’t help but love. He has many, many issues. One of the main issues is his disrespect for women. Of course, all that changes when Abby enters his life, and we get to watch Travis become a completely different person. Watching him go through all the emotions and feelings that come along with falling in love with that one special person, it was intense to read. One thing that I really loved about Walking Disaster was that we get an epilogue at the end of the book. I LOVED that the author decided to add this onto the book. Had there been one on the first book, I probably would have loved the book more than I originally did. Another thing that I really loved is that although the book is the same story that we read from Beautiful Disaster, the author worded it so that it seemed like a whole new book to me. I enjoyed getting to see things from Travis’s perspective. Overall; If you loved Beautiful Disaster, you are definitely going to enjoy reading Walking Disaster from Travis’ point of view. It’s such a great read, one that I will definitely re-read over and over again.